Masumi Watanabe's parents, Hideichi and Fumiko Watanabe, and translator Mieko Crans attended a memorial service for her at Kawaiaha'o Church last Saturday. Hideichi Watanabe said he would have liked to be in Hawaii for the jury verdict convicting Kirk Lankford of his daughter's murder, but had to return to Japan to care for his parents. All Hideichi Watanabe wants to know is, Where did convicted killer Kirk Lankford put the body of Watanabe's daughter, Masumi? Lankford testified that he put her body into the ocean off Kualoa after she dived out of his truck and hit her head on a rock, killing her. But Hideichi Watanabe does not believe Lankford's story. "I understand the ocean and its conditions. In the event that he did what he said, I believe the body would have surfaced," Watanabe said through a Japanese translator yesterday in a conference call to the city Prosecutor's Office. Lankford was convicted Monday of second-degree murder in the death of Masumi Watanabe, who disappeared last April in Pupukea. Watanabe's family was in Hawaii for a memorial service for her last Saturday but had to fly back to Japan to care for Hideichi Watanabe's parents when the jury returned its verdict. Hideichi Watanabe also said he would like to see Lankford get a sentence of life in prison without parole -- for the safety of everyone. Masumi Watanabe's father expressed gratitude yesterday for the jury verdict convicting Kirk Matthew Lankford of his daughter's murder. In a conference call at the city Prosecutor's Office, Hideichi Watanabe also thanked the people of Hawaii, volunteers, creators of the findmasumi.org Web site, the Honolulu Police Department, the city Prosecutor's Office and the jury for their support. The jury found Lankford, 23, guilty of second-degree murder Monday. 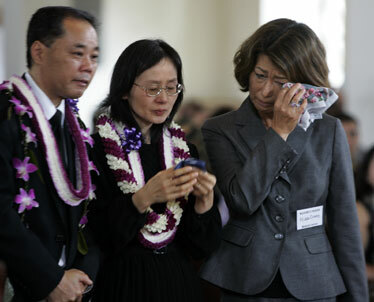 Masumi Watanabe's parents and two older brothers were in Hawaii for a memorial service for her last Saturday but were on a plane back to Japan when the jury returned its verdict. Hideichi Watanabe said he would have liked to have been in Hawaii for the verdict but had to return to Japan to care for his parents. If given the chance to speak to Lankford, Watanabe said he would ask him where he hid his daughter's body. Masumi Watanabe, 21, was last seen April 12, 2007, in Pupukea. Her father said he does not believe Lankford's claim that he disposed of the body in the ocean off Kualoa. "I understand the ocean and its conditions. In the event that he did what he said, I believe the body would have surfaced," Watanabe said through a Japanese translator. Watanabe said he would like to be back in Hawaii on May 27 when the jury is scheduled to hear evidence on whether Lankford can be sentenced to life in prison without parole. The mandatory sentence for second-degree murder is life in prison with the possibility for parole. City Prosecutor Peter Carlisle has asked state Circuit Judge Karl Sakamoto to sentence Lankford to life without parole because he is a danger to the community. Watanabe said he would like to see Lankford get the harsher sentence to prevent another murder from happening and for the safety of everyone. Lankford's father, Howard, sat through all five weeks of trial and was at last Saturday's memorial at Kawaiaha'o Church. The Watanabes had been advised that he might show up and had taken steps to notify him not to approach them. Watanabe said he felt conflicted when he learned Howard Lankford was at his daughter's memorial service, especially since the jury had not yet returned its verdict. "I wanted to know what the reason was that Mr. Lankford's father would come and how Mr. Lankford's father felt in his heart. But in the end I don't think I really wanted him there," he said. The family did not expect Kirk Lankford's wife, Corrine, to show up and only learned she was there just before she was about to meet them in the receiving line, said family representative Bob Iinuma. He said the Watanabes did not turn her away because Masumi's mother, Fumiko Watanabe, saw that Corrine Lankford was in tears and was also hurt by what happened, he said.